Whether you are a novice to winter sports or an expert, one of the most important ingredients to having an enjoyable experience is to dress efficiently; it's not as simple as pulling on a hefty sweater and giant parka. For skiing, snowboarding, snowshoeing, winter running, ice climbing, or any other outdoor pursuit, the goal is to stay warm and dry. How to do it? Dress in multiple, lightweight layers. The beauty of layering is that you can shed and add clothing as conditions or your exertion levels change. Thanks to new high-tech fabrics, personal climate control is now a reality: body-warmed air is trapped between layers of clothing while moisture vapor from perspiration is allowed to escape. A layering system usually includes three components: an inner moisture-wicking layer; a middle insulating layer; and an outer shell layer. It’s important to keep several things in mind as you consider the numerous styles and fabrics available for each layer. Garments should be lightweight and compressible; if you need to shed a pullover, for instance, it should easily fit into a fanny pack or rucksack. Look for high-quality synthetic fabrics that are breathable. Be sure to choose a shell that is large enough to fit comfortably over several layers and try to select garments that are versatile enough to adapt to changes in the weather and useful for a variety of activities. Additional variables to consider include your fitness level, your body type, the activity you’ll be doing, and where you’ll be doing it. Do you chill easily? Sweat a lot? Dress accordingly. Highly aerobic activities such as cross-country skiing and running require very different clothing systems from sports such as snowboarding and downhill skiing, in which your energy output constantly fluctuates. If you’re heading into the backcountry or will be far from a heated shelter for any extended period, your clothing will be as important as any piece of equipment you have. It can mean the difference between life and death. The weather, of course, is one of the most significant factors in what you decide to wear. Heeding the weather forecast can help ensure an enjoyable excursion; ignoring it can make you rue the day you first strapped on skis or boards. Even if you’ve checked the weather report, you should always be prepared for unforeseen changes. Remember Murphy’s Law, and be prepared for anything, particularly in the backcountry. Even though the thermostat reads 15 degrees and you can see your breath, if you're running, hiking, snowshoeing, or cross-country skiing, you can expect to heat up fast and perspire. If the sweat you produce during this workout is trapped next to your skin, you will eventually feel chilled. Not only is this cold clammy feeling uncomfortable, it can be dangerous, especially as you start to cool down. Protect yourself by wearing lightweight layers that you can remove quickly and stow away as you warm up. They should be compressible; if you need to shed a pullover, for instance, it should easily fit into a fanny pack or rucksack. Look for high-quality synthetic fabrics that are breathable. Moisture management is the first consideration here. To keep the body warm during high-energy activities, clothing should transport moisture away from the skin to the outer surface of the fabric where it can evaporate. Tall order? Fortunately, companies such as PolarMax are using ultra-light fabrics like Acclimate Dry in their long underwear. These materials wick moisture from the skin and move it away, so start with this as an inner layer. Also, look for garments made from the new stretch fabrics for better fit and performance. Your next layer should be a lightweight stretchy insulator, such as a breathable fleece sweater or vest. While you might not need it once you’ve warmed up, you’ll appreciate a cozy top on your descent or on the ride home. The final part of your cold-weather wear should be a lightweight and versatile shell jacket that will function for highly aerobic, as well as less strenuous activities, depending on what you layer under it. Fabrics like three-layer Gore-Tex and Windstopper allow companies to create shells that are ultra lightweight while remaining waterproof, windproof, and breathable. For aerobic activities, a shell's ventilating features are particularly important. Look for underarm zippers, venting pockets and back flaps. Depending on the activity and weather, a lightweight wicking layer and stretch fleece pant are often all you'll need on the bottom. In deeper snow, you can wear gaiters to protect your feet and ankles, but carry lightweight shell pants with side zips just in case the weather gets nasty. Always bring a hat and gloves, regardless of the weather or your activity level. As with the rest of your clothing, synthetic materials work best for protecting you against the extremes, and they don't itch! Look for fleece hats made with Windstopper fabric, gloves and mittens layered with Gore-Tex and fleece, and socks made of synthetic, moisture-wicking materials. It's 8:30 a.m. and you're in the parking lot at Breckenridge or Stowe, surveying the skies and your duffel bag as you try to decide what to wear. Getting dressed for a day of downhill skiing or snowboarding can be especially tricky. In the next several hours, you'll work up a sweat carving turns and negotiating mogul fields, but you'll also sit on the chairlift, exposed to biting winds and wishing you had a down-filled mummy bag. As you mull over your ensemble, keep the basic principles of layering in mind, incorporating warmer, windproof garments with plenty of venting options. Underneath, choose mid- or heavyweight long underwear with wicking capabilities. Staying dry is the best way to combat the inevitable cooling while you're at rest in the lift lines and on the chairlift. Also, look for undergarments with zip turtlenecks. Next, layer on a lofty insulator, such as fleece pile, to trap warm air and protect you against the cold. Again, the fabric should wick moisture and breathe to help you stay dry. Another good option for skiing and boarding is windproof fleece. 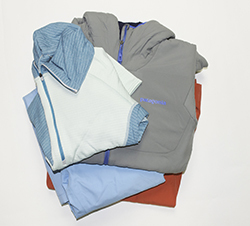 Several manufacturers offer garments that feature a layer of wind protection sandwiched between layers of fleece, providing extra warmth and protection without added weight or bulk. Shells for downhilling should be completely windproof and have many ventilation options. A longer, three-quarter length shell parka will keep wind and snow out most effectively with the added benefit of keeping your backside warm on the lift. A hood is handy for extra head and neck protection in high winds. For the best performance and comfort, wear shell pants over stretchy fleece tights. Features to look for in shell pants include full side zips for ventilation, articulated knees for ease of movement, and bibs for extra snow protection. Some people, particularly snowboarders, like an extra layer of warmth and padding for sitting in the snow; it's also nice on the lift. What's wrong with wearing cotton? Cotton is a poor choice for insulation, because it absorbs moisture and loses any insulating value when it gets wet. Hence, moisture-wicking synthetics, which move moisture away from the skin and stay light, are the best choice for active winter sports like skiing. Not only do synthetic fabrics wick moisture away from the skin, they dry quickly and help keep the wearer warm in the process. What's the difference between Gore-Tex and other shell fabrics? Gore-Tex is actually not a fabric but a membrane that is laminated to a shell fabric such as nylon or polyester. Before the mid-1970s, when Gore-Tex was invented, wearing a water- and windproof shell jacket meant sacrificing breathability. Both waterproof and breathable, Gore-Tex set a new standard for technical outerwear. Today, many outdoor clothing manufacturers offer functional alternatives to Gore-Tex, all of which provide varying degrees of waterproofing and breathability. One of these alternatives might work for you just as well or better than Gore-Tex--it's really a matter of assessing your personal needs, depending on your activity level, body type, and where you’ll be skiing, boarding, or snowshoeing. What items are absolutely essential when it comes to having a budget? For any outdoor winter activity, an inner wicking layer is crucial. Nothing will help you stay warm and comfortable more than a garment with moisture-transport capabilities. You can purchase an inexpensive fleece insulator that will function during most activities. Look for features that add versatility, such as a snap- or full-zip turtleneck. An outer shell doesn’t always have to be both waterproof and breathable; you can consider more affordable alternatives that are highly water-resistant, yet still breathable. Again, keep versatility and ventilation in mind. Snap-off hoods, underarm zippers, and ventilating pockets are features that add value and performance to a shell garment. A pair of full side-zip shell pants are another investment worth making. As the weather changes, you can easily put them on or take them off without removing skis or snowshoes. Where is there more info on how to dress for winter sports? There are many good sources of information on apparel. On the Internet, check out Ski and Skiing, which contains sections on apparel and fabrics used in the outdoors. Also, the SnowSports Industries of America can help you locate many outdoor manufacturers. Other good sources are W.L. Gore & Associates, the creator of Gore-Tex, Activent, Windstopper, and other technical outdoor fabrics, and Patagonia, a manufacturer of high-quality outdoor apparel for serious skiers, boarders, hikers, runners, and climbers.